(CNN) -- Rising star Shane Lowry became only the second amateur to lead a European Tour event at the halfway stage at the Irish Open at County Louth on Friday. 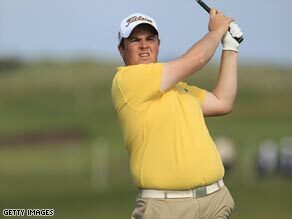 Local amateur Lowry is the shock leader after the second round of the Irish Open. While local hero Padraig Harrington failed to survive the halfway cut despite improving five shots on his opening 68, and American star John Daly also went out, little-known Irishman Lowry scorched round the Baltray links in a magical 10-under-par 62 to match the lowest round ever achieved by an amateur on the European Tour, by German Sven Struver 20 years ago. It would also have broken the course record but for the fact that just over an hour earlier Northern Ireland's Graeme McDowell blitzed an incredible course record 61 -- the lowest round of his professional career and an unbelievable 16-stroke improvement on his opening 77. However, they were not the only two dramatic rounds on a day of low scoring, with former British Open champion Paul Lawrie winning himself a $60,000 car for a hole-in-one on the 17th as he kept alive his hopes of a first victory for seven years. Lawrie had a second successive 66, but is three strokes behind Lowry's 15- under-par aggregate. England's Robert Rock ande Welshman Jamie Donaldson both posted 65s to head the chasing pack two strokes adrift. Meanwhile, first round leader Francesco Molinari of Italy suffered the first disqualification of his European Tour career, 24 hours after breaking the old County Louth course record. Molinari had added only a 73 to his opening 63 but then failed to spot that playing partner Peter Hanson got two figures the wrong way round on his card. The 26-year-old from Turin had taken a double bogey on the 442-yard 12th, his third, but Hanson waited until the turn to write down the scores because the weather was so bad and entered the six on the 13th hole instead. Molinari added his signature, handed it in and left the recording area -- and that meant disqualification when the mistake came to light as his statistics were being entered on a computer.